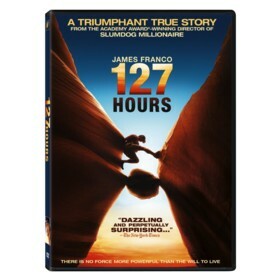 127 Hours is a Drama movie starring James Franco, Amber Tamblyn, and Kate Mara. The movie was directed by Danny Boyle and released by the Pathe studio on 2011-01-28. The movie has an MPAA Rating of R (Restricted). Our users found the overall impression of this film to be Inspirational. The movie's official site can be found at www.127hoursmovie.com. Fantastic movie, wonderfully acted and based on true events. I recently decided to rent this movie after hearing that James Franco was snubbed for actor of the year. I must admit after watching this movie I tend to agree. The basic plot of the movie is that a Hiker/climber named Ryan Alston (James Franco) decides to climb a canyon in Utah but ends up in a tumultuous position during his adventure as a huge rock falls as he is descending...trapping his arm. The visuals and sound in the film are superb. The way the music links his memories is very nice and the sound effects really get you freaked out when you need to be...like during the arm scene. I don't want to ruin the film for anyone, but as you may or may not know there is one scene in the movie in which Marco has to free himself from the rock. This particular scene is quite visual and gruesome and not for the faint of heart, but it is required in this movie in order to convey just how hard it is to do what he did. The sound and music in this scene is quite visceral and hard to watch and hear but it conveys and draws emotion very well. Overall the plot of the movie is excellent and really tells the story well and describes how Alston managed to get into this predicament. They also tried to stay true to the book (Thank Danny Boyle for this). The movie never gets boring and I found it very entertaining. The visuals look very good on blu-ray and anyone with a High Definition TV will really enjoy the beautiful vistas. This is a must watch movie for anyone who appreciates a good survival movie or good action/adventure/Drama film. The only caveat I have is that one visceral scene which will be hard to watch for the easily squeamish.